Born in Kandy on July 27,1940 to Loku Bandara and Iona Ratwatte Kobbekaduwa as their second child, Denzil L. Kobbekaduwa grew up at Deldeniya Walauwa in Kandy (Paternal residence) of Deldeniya village in Menikdiwela Kadugannwa and Amunugama Walauwa (Maternal residence) of Amunugama village close to Kandy. These areas were close to the Kadugannawa hills and the Dumbara Valley surrounded by the Mahaweli River with unspoilt environment close to nature where he was brought up by his parents. Denzil had his nursery education at Hillwood College, Kandy which happens to be the sister School of Trinity College. In 1948, he was admitted to Trinity College, Kandy and started his educational activities. It is on record that Denzil excelled in his studies and sports from his early days at Trinity College, Kandy. As a student he made steady progress in his studies and also developed his leadership qualities. He was a role model to many others in school, to society and his close family associates. As a person who had the privilege to associate with him since my childhood days, we, the close cousins of General Denzil Kobbekaduwa, always looked upon him as a hero and role model. He was our saviour at times when we were in trouble. At Trinity College, he was able to complete the G.C.E. (O.L) examination and the H.S.C examination (University Entrance examination). His performance in the field of sports was excellent. He represented Trinity College at rugby, hockey and cricket. He captained the Trinity 1st XV in 1959 and was awarded the Trinity Lion. He was the vice captain of the Trinity hockey team in 1959 and was awarded college colours. He also represented the Trinity 1st XI cricket team and was an athlete and basketball player too. Apart from his excellent school career record, Denzil was also a school Prefect of Lemuel House in 1960 and later appointed Senior Prefect the same year. However, this appointment lasted only for a week since he opted to pursue a career with the Sri Lanka Army (Formerly Ceylon Army) and was enlisted as an officer cadet and posted to Diyatalawa for his initial three months' training before leaving for a two year officer training programme at the Royal Military Academy, Sandhurst in the United Kingdom, These circumstances prevented him from qualifying for the coveted Ryde Gold Medal for the Best All Round Student of Trinity College in 1960. Thus, an academic career with the University of Peradeniya to which he had gained entry, had to be abandoned. In early 1960, Denzil left on a two year stint to the United Kingdom. I can still remember that day when close family associates came down to Colombo and met in the Colombo habour to say bon voyage since it was a three week journey by ship to the UK those days. Some of us were privileged to accompany him on board the ship Carthage. General Denzil Kobbekaduwa statue at Anuradhapura Teaching Hospital. Having successfully completed his assignment, Denzil returned to Sri Lanka (Ceylon) in mid 1962 and assumed duties as a lieutenant in the Armoured Crops Regiment of the Sri Lanka (Ceylon) Army. He had a very successful period with the regiment and also represented the Army Sports Club at rugby for the Clifford Cup tournament. The supportive role played by him to fellow soldiers helped the Army Sports Club to gradually develop their performance and be a leading side in the Clifford Cup tournament. In 1964, Denzil was awarded his second overseas training course to Bovington Military Academy in the United Kingdom. However, this was a six month programme which he completed with great success. On his return to Sri Lanka, he was once again back with his Armoured Crops Regiment. Since then Denzil was able to perform as a true solider/officer and commanded the respect of his superiors, peers as well as the subordinates. His honest contribution at work as a soldier/officer which was appreciated by all fellow soldiers. He became an unfortunate victim of a politically manoeuvred drama, for which he along with several other officers were sent on compulsory leave pending investigation. During this period he spent his time in Kandy with his family and helped Kandy Sports Club to produce a formidable rugby outfit to challenge all A division clubs in Colombo, Tri Services sports clubs, Police Sports Club and Up country planters' rugby clubs. As a result of his efforts, he was given the captaincy of the Kandy Sports Club in 1969 and ended up as runners up to CR and FC in the Clifford Cup A Division tournament. He also captained the upcountry combined clubs team and also represented the All Ceylon Team ( Sri Lanka ) against French and British top division clubs. Denzil did not forget his alma mater Trinity College and was also involved in coaching the Trinity 1st XV outfits in 1968, 1969 and 1970 and helped Trinity produce Bradby Shield winning and league champion teams. Due to his honest efforts he was able to command the respect of all communities living in Kandy and the rugby circles in Colombo and up country. It was also during this period, whilst playing Rugby for Kandy Sports Club that he met Lalini Ratwatte, the younger daughter of Kenneth and Merle Ratwatte, which blossomed into a healthy love affair. They got married in December 1970. Lalini was a tower of strength to Denzil and was a very understanding and accommodative person. She supported Denzil to a great extent in developing his career in the Army and building a healthy relationship with his family, friends and relations. The government in 1970 exonerated Denzil from the charges and reinstated in his substantive post in the rank of captain and later major. With the respect and confidence he had gained, he was put in charge of the security of the then Head of State Sirimavo Bandaranaike and subsequently promoted to the rank of Lt. Colonel. While playing an active role in the Sri Lanka Army, he continued to coach and play Rugby for the Sri Lanka Army and the Defense Services. In 1973/74, Denzil was appointed as the Sri Lanka Rugby Football Union secretary. The first ever Rugby Asiad was held in Sri Lanka that year and Sri Lanka were runners-up to Japan. During the latter part of 1974, Denzil was selected to attend the prestigious British Army Staff College Military Academy, Camberly, Surrey in the United Kingdom for one year. On his return Sri Lanka, he was once again back at his Armoured Crops Regiment for some time and was posted to the Officer Cadet Training School at the Diyatalawa Military Academy. His extended family and friends were regular visitors in his bungalow. With the completion of the stint in Diyatalawa, he moved to Army Headquarters, Colombo and served in the operations desk until such time a posting was given to him in Jaffna to serve in the Task Force Anti Illicit Immigration (TaFAII). During this period he was able to successfully study the terrain in the Jaffna peninsula. Having completed his stint at the TaFAII Headquarters in Jaffna, he was once again back at the operations desk of the Sri Lanka Army Headquarters for some time and later moved to his regiment Armoured Corps as the Commanding Officer. In 1989, he went to the United Kingdom on another military training assignment at the prestigious Royal College of Defense Studies (RCDS), which is the highest institution for military training. However, with the change in the political leadership of the then government, who were not happy about him being offered this prestigious training programme, tried to get him to return prematurely to the island. But due to pressure applied by the sponsors and the UK government, Denzil was permitted to go back to continue his training in the UK. Having successfully completed his training, Denzil was appointed the Commander of the Western Command stationed at the Panagoda Cantonment in the rank of Major General. When the Eelam war started in the Eastern Province, Denzil was sent as the overall operations commander. 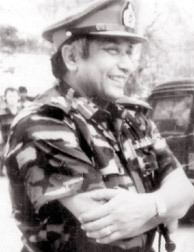 During his short stay in the Eastern Province, he was able to contain the LTTE offensive to a greater extent, but, as a result of the Northern Province also coming under heavy attack he was moved to the Northern province as the overall operations commander based at the Palaly Cantonment in the Jaffna peninsula. He lead his troops effectively from the front, fought many battles. The Vadamarachchi Operation, Operation Balavegaya beach landing to save the Elephant Pass Security Forces camp (Minipe Kularatnes heroic acts), evacuation of the Security Forces from the Jaffna Fort are a few of the many operations he lead. His last Security Council meeting as the Northern Commander was in Colombo in early August 1992 which was presided by the Head of State. Denzil expressed his frank views with regards to the security situation in the North and wanted to continue the LTTE neutralizing operation. 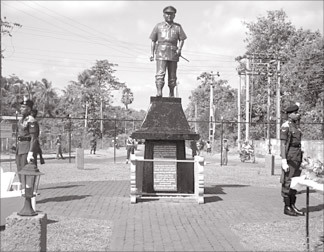 Denzil and a set of elite officers laid their lives for the nation on the August 8, 1992 at Aralai Point, Jaffna. His demise was a great loss to his beloved family, close relatives, the SriLanka Army and other Security Forces and to the whole nation. As a civilian, I had the opportunity to closely associate with Denzil for over 40 + years. His loss to me, the rest of the family members, relatives, friends and fellow soldiers was unimaginable. July 27, 2012 happened to be Denzil's 72rd birth anniversary and on August 8, 2012 will be his 20th death anniversary. “Your family have continued to bestow the blessings of the Noble Triple Gem by holding various religious ceremonies continuously for the last 20 years and this year too it will be carried out. The religious ceremonies will continue in the years to come since all your followers appreciate the services rendered by you to your family, relatives, friends and Sri Lankan society as a whole. “We will continue to remember you. Your name will be written in the history books in Sri Lanka and the entire globe so that the future generations will know that you were a born soldier, true leader loved by all. Also may I add that through Denzil's leadership, his contribution to Sri Lankan society was immense. To his family, he was a devoted husband and father, to his parents an obedient son, to his sister and brothers a trusted friend, to his relations, he was a role model accepted by all, to his fellow soldiers, he was a Commander with a genuine heart, to his friends he was a person always willing to play a supportive role and guide them, to his alma mater his contribution was immeasurable, to the sporting bodies in Sri Lankan schools and clubs (specially Rugby) was enormous, to the religious institutions of all faiths his contribution was accepted by all Sri Lankans. The services rendered by him specially to the people of the North and East will always be appreciated.